The [Cherokee Squaw X Silver King] matured for me. I attribute that partially to our unusually late frost this fall. I inadvertently selected for late maturity... It was growing them in isolation in a field where I don't generally grow sweet corn, so I did what I normally do and husked the cobs at the late dough stage and left them attached to the stalks. When I came back a week later nearly every kernel had been eaten. So I was left with the late maturing cobs. I left them in the husks until harvest and then husked them and dried them on the porch. That was great, because after a couple of days the su-su/se-se (on many cobs) had turned finely wrinkled but the other kernels were still non-wrinkled, so I marked the su-su/se-se kernels with a marker. The cobs dried unevenly, so not all cobs got marked, but for those on which it worked it worked very well. Pick cobs at the late dough stage. Leave in the husks to take back to the barn. dry on nails driven into a board so that all sides of each cob are equally exposed to the air. Do the drying in a place were the sun doesn't reach. Check several times a day for a few days to determine when each cob is ready for selection. Mark selected kernels with a marker. I took photos. Will try to upload them later today. Joseph, I'm going to ask this guy who does welding to make me a dozen of these, so I can hang them from the barn ceiling. The braiding and hanging of the corn, although traditional, takes a long time and I think this would be quicker. Holly, You can do a better job with a 4 X 8 sheet of 1/2 inch thick plywood and some 16 penny nails. Lay the plywood down on the ground, use a chalk line to mark it into triangles with 5 inches between vertices. Drive a nail through the plywood at each point. Pick up the "spiky" plywood and attach it to a convenient wall out of direct sun. The end result will be a hexagonal arrangement of nails which can conveniently hold 212 ears of corn. If you want to get fancy, bend the nails upward as you slip an ear of corn on. If you want it suspended from the ceiling, just attach to some heavy wire and hang away. Come to think of it, you could use both sides of the board if you hang it from a ceiling beam. That would get you 424 ears of corn. Just be careful NOT to bump into it in the dark. Joseph, Sounds like you have varmints too. joseph, what do you mean by 'dough' stage? When sweet corn is at it's best for eating fresh I call it the milk stage. If you crush a kernel it's full of milky looking juice. When sweet corn is some weeks past it's best eating stage I call it the dough stage... If you crush the kernel, it looks more like bread dough: thick and sticky. I often use early and late with either milk or dough to describe how far along it is in the process. Anything in the milk stage is great eating. Late milk stage is usually quite sweet in sugary enhanced corn. Some dough stage sugary enhanced cobs can still be very sweet, but the texture is getting more and more firm. After sweet corn reaches the dough stage, and especially the late dough stage, I can have problems with it molding, or sprouting inside the husks, so I try to harvest it by then, especially if rain is expected, or if I need to irrigate another crop. I've already selected homozygous se kernels from it to send to someone else's breeding project in an exotic place. What does not get selected makes good chicken feed. It is pretty corn. Truly some fine look maize. And I imagine it'll make some real pretty, baby blue tortillas. On page 3 of this thread there is a discussion about the purple color shown by Cherokee Squaw. I finally dug out some information on the web that explains why this happens. It turns out to be a polygene effect. Congratulations Joseph, you got it first try. The genes involved are C1, R1, and Pr1. C1 is on chromosome 9. R1 is on chromosome 10. Pr1 is on chromosome 5. The way it works is fairly simple. C1 must be on, R1 must be on, and Pr1 must be present to result in purple color. If C1 is off, then the aleurone is colorless letting the endosperm color show through. If R1 is off, then the aleurone is colorless letting the endosperm color show through. If Pr1 is off, then the aleurone is either colorless or else a different color based on other genes. C1, R1, and Pr1 are very very very highly polymorphic with a high number of known variations. There is a dominant form of C1 that always is expressed and always results in colorless aleurone. This makes it even trickier to understand because you could have c1/c1 which is recessive and always results in colorless aleurone or you could have C1`/c1 or C1`/C1` which would do the same. Now it gets a bit tricky and this is where I have a MAJOR difference of opinion with the online source that shows how aleurone colors work. The endosperm including the aleurone is triploid. This means there are 3 versions of C1, 3 versions of R1, and 3 versions of Pr1 in each kernel, but caveat that two versions of each are identical because they derive from maternal tissue. In effect you have only 6 possibilities. I can derive from this that Cherokee Squaw is homozygous for Pr1 and is segregating for C1 and/or R1. Probably it is homozygous for R1 and segregating for C1 but I can't prove this without some tests and breeding work with known stocks. This infers that I could easily develop an all white version of Cherokee Squaw or an all purple version. There is also a suggestion that Silver King carries a hidden copy of C1 that is active but not expressed because either R1 or Pr1 or both are missing. Another item I dug out is that there is an intensifier gene in1 that causes pigments to be expressed very much more than normal. 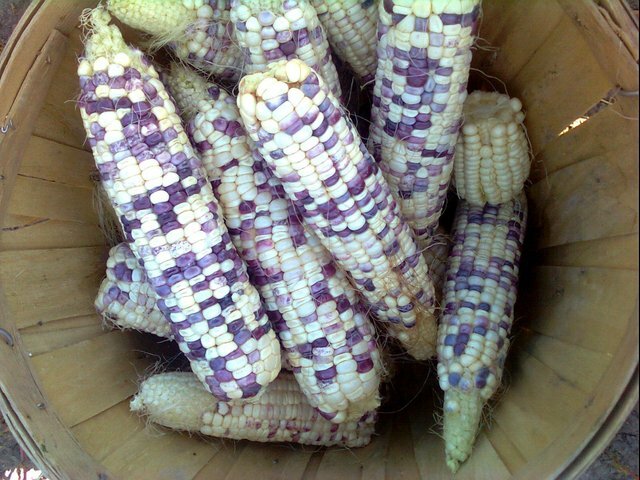 The maize morado types from South America are most likely homozygous for in1 on chromosome 7. Fast forward to 2012 and 2 rows of F2 corn from the cross of Cherokee Squaw X Silver King. I grew out one row of seed last year and saved the best ears for hand shelling and seed selection. The ears were selected for white cobs, long full ears, and 14 to 18 rows of kernels. From roughly 20 ears, I shelled out a pound or so of kernels that were shriveled and therefore must be homozygous for the su gene. I planted about half of the seed in my garden this spring and now have 2 rows of very healthy corn just starting to tassel. I still plan to apply the original selection criteria. It is easy to de-select certain stalks already because they are crooked or have leaf defects. Dar, how's the high protein x Cherokee flour corn coming? Holly, from seeing the tassel time on the Cherokee Flour, it looks like I have a better bet to cross the high protein X Supai Red. I'll know more in a few weeks. Either way would give a high protein corn in a white flour background, but the Supai Red might be a better option from your perspective. We will see. I checked the corn today and have ears that are just nearly mature enough to eat. By this weekend, I expect to be able to pick as much as I care to eat. Some interesting traits are showing up. The first is that the ears are on average a bit shorter than expected. Most are between 7 and 8 inches long. the second is that the shucks are much longer as in 10 to 12 inches long. The result is a very high level of resistance to earworms. So far, I have not found any earworm damage though that will change in the next week or so. The corn was blown over by the windstorm a week ago. This is not in my opinion a problem, the wind was hitting 100 mph and blowing directly across the rows. Even blown over, the corn is continuing to mature and most of it has stood back up well enough to make a crop. Note that only about 1/4 of the stalks were blown over so all things considered, I would rate this corn very well rooted given the wind velocity it survived. Today I planted the presumably homozygous se F2 seed of [Cherokee Squaw X se] that I grew out last year. The original cross was made by DarJones. I ended up with 16 kernels that passed the density test and the soak tests. I also planted the presumably se+ F2 seed of [Ashworth X precocious] that passed the same tests. I am intending to self them this summer. I am going to have to buy some books on corn so I can pick up your biology jargon without having to do net searches. Biology was one of the few classes I got good grades in without much studying and now I truly regret not sticking with it in college. I wish I had the space but more importantly patience to even try what you are doing. I find it amazing one has the cajones to do this just because he can, marvelous. God speed and good work.